I feel as though I may have created a monster in Smith. Since he has seniority at home now, I've been letting him take over some of Caroline's "jobs." Like licking the spoon from the peanut butter jar, helping me change the twins' diapers, getting their bottles out of the cabinet, and finally, helping me in the kitchen. Most recently, I was churning this sorbet, and he was beside himself when I let him sit on the counter and watch it churn. And as he quickly learned, one of the perks of watching it churn is that you get to lick the dasher when it's done. That's a big deal for my little dude. However, he saw me scoop the sorbet into the container, then store it in the freezer. And since then, several times a day he runs over to the freezer, grabs the handle, and says "I want. ice cream." He can't say "Caroline" correctly, but he has "ice cream" down. Go figure. Since he's just so darn cute when he does it, I've been obliging more often than I probably should, giving him a spoonful here and there. I don't feel too guilty though, because this sorbet is actually pretty guilt-free. With over a pound of fresh fruit and less than half of a cup of sugar, this is definitely in the "light and healthy" dessert category. Sneaking him bites here and there definitely isn't the same as if we'd churned say, triple chocolate fudge salted caramel swirl toasted marshmallow brownie batter ice cream. Summer produce is totally at it's peak right now, so the flavor of this sorbet is bright and fresh. Since peaches are typically super sweet, they pair nicely with the tartness of the raspberries here. And look how pretty it is - such a lovely shade of pink. If you're so inclined, dropping a small scoop into a glass of champagne makes a lovely little cocktail as well. 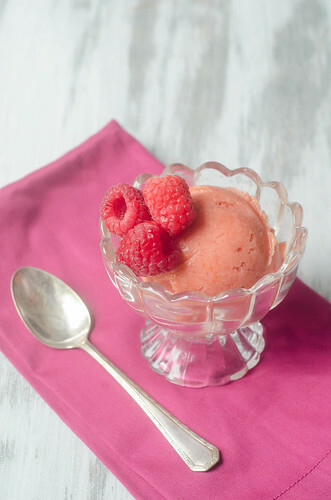 There's something for everyone with this sorbet! Peel and pit the peaches, and cut into chunks. Combine with water in a medium saucepan, cover, and cook over medium heat for 8-10 minutes, or until they're soft and cooked through, stirring occasionally. Remove from heat and stir in the sugar and raspberries, and cool to room temperature. Puree the mixture in a food processor or blender until smooth. Press the puree through a mesh strainer to remove seeds and pulp. Stir in the peach schnapps. Chill the mixture for several hours, then freeze in your ice cream maker according to the manufacturer's instructions. Aww Smith sounds like such a cutie! I wouldn't be able to resist giving him a few scoops either...even if it was salted caramel triple brownie chocolate marshmallow deliciousness. But bonus that it has so much fruit! two of my favorite fruits squished together! sounds so good! I've been making a lot of sorbet recently too. Btw, triple chocolate fudge salted caramel swirl toasted marshmallow brownie batter ice cream sounds amazing.